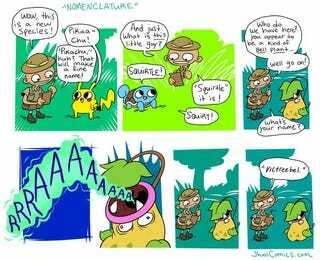 Pokémon are usually named after the sounds they make, unless those sounds are, well, screaming. Pokémon are usually named after the sounds they make, unless those sounds are, well, screaming. We see this in action in the comic drawn by Justin Hall of Jhallcomics.com. The unnamed spelunker probably had a list for these cases.